Greetings and salutations, everyone; yes, once again it is I, Mani the purebred border collie, Mani the Sprechhund, filling in for the guy I live with, and here to bring you the latest news from our garden. You may remember me from such posts as “Stuff You Didn’t Know”, among so many, many others. Here I am in a characteristic pose. Maybe you notice what’s happened since the last time I posted. Another new fence. Or I should say another replacement fence, to replace something which was very ugly. (It may look like it slants down to the right, in the picture, but it is totally level.) Another section needs to be added to the right of the one you see there, so that the little garden called “The Enclosure” is really enclosed, at least on three sides. I guess when that fence gets built, which might be pretty soon, I can tell the story of that garden, though it’s probably been told two or three times already. So all of a sudden it’s May. I guess this is not the guy I live with’s favorite month. And the thunderstorm warnings have started. 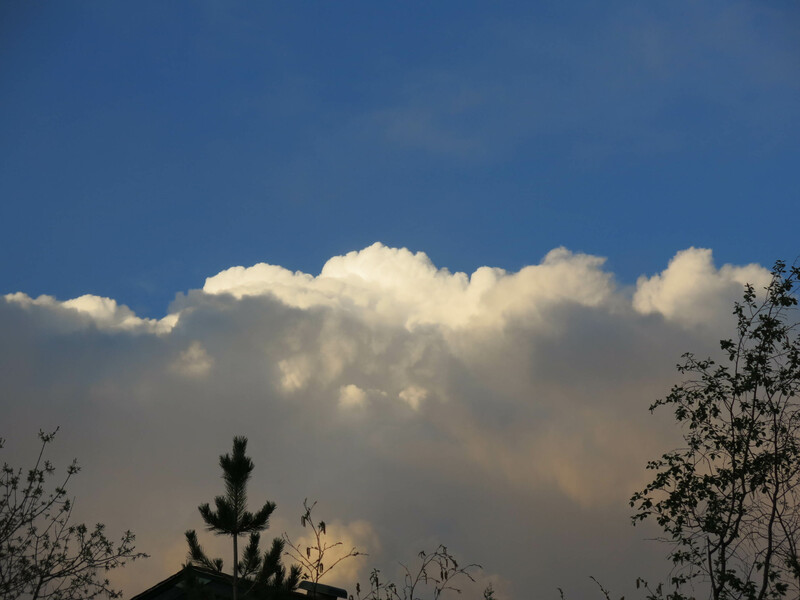 This was taken looking northeast, yesterday, when it wasn’t May. The guy I live with hates thunderstorms. I feel the same way. He said that if we won the lottery we might move to a place where they don’t have thunderstorms, and just while away the while pleasantly, instead of cowering in terror for four straight months, the way it can be here some summers. At least he doesn’t work any more. There are of course some things about working that were good, but being separated from home when there was a bad storm here, and he was working, was not a good thing, and that anxiety still surfaces from time to time. So far nothing has happened, weather-wise, so I thought I would show some pictures of flowers. A couple of these were posted on Facebook but will look better here. 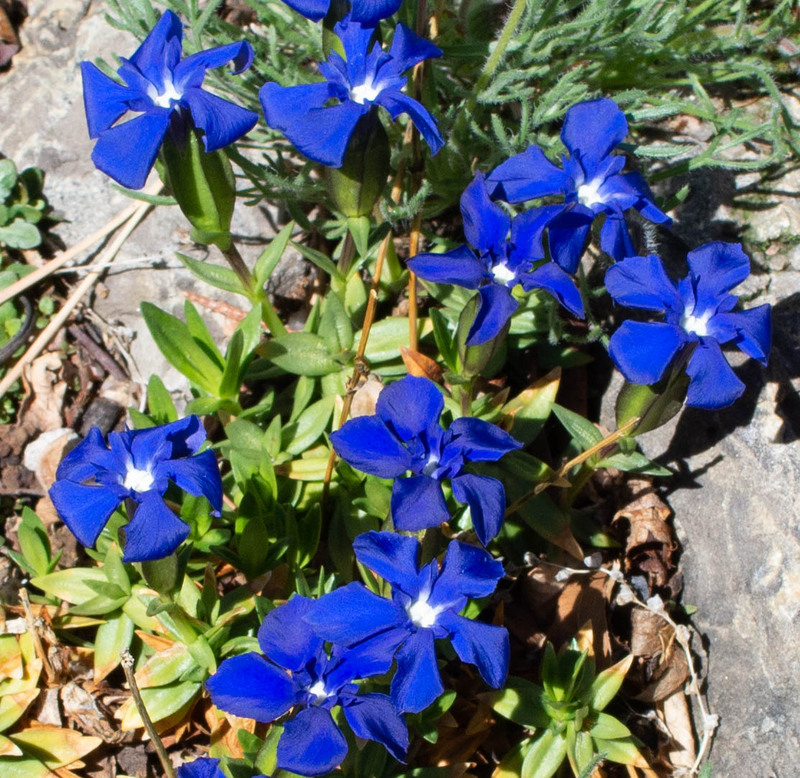 This is Gentiana verna, which was grown from seed, and has been in the trough for many years. It even reseeds into the trough. The plant was bigger but a large section was accidentally pulled out some years ago during an episode of frenzied weeding. This colony of Fritillaria pallidiflora was started from a few plants grown from seed, years ago. The bulbs have produced a lot of seed; there are even more plants than you can see here. It is kind of amazing that this happened, since so many other attempts at growing bulbs from seed have been spectacular failures. 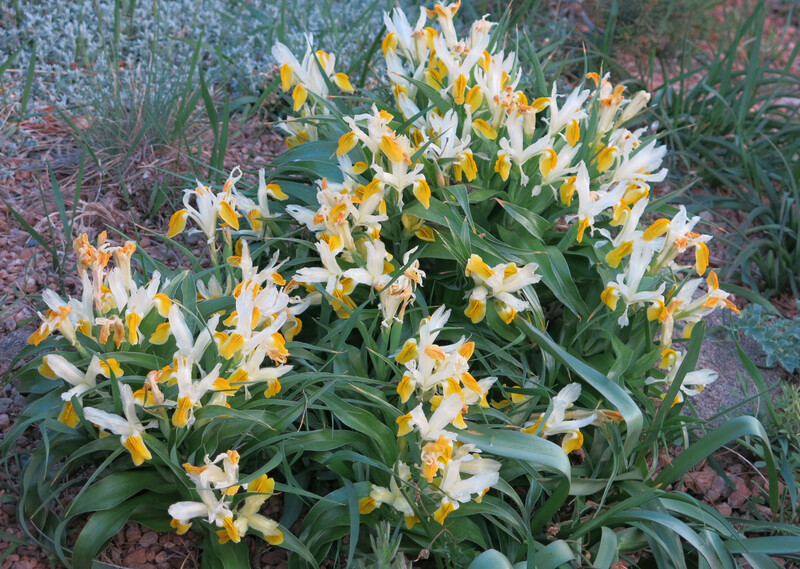 It’s been a variable year, I guess you would say, for the Juno irises. Some flowered last month, some got frozen, and some didn’t flower at all because it got too cold right as the buds were forming. 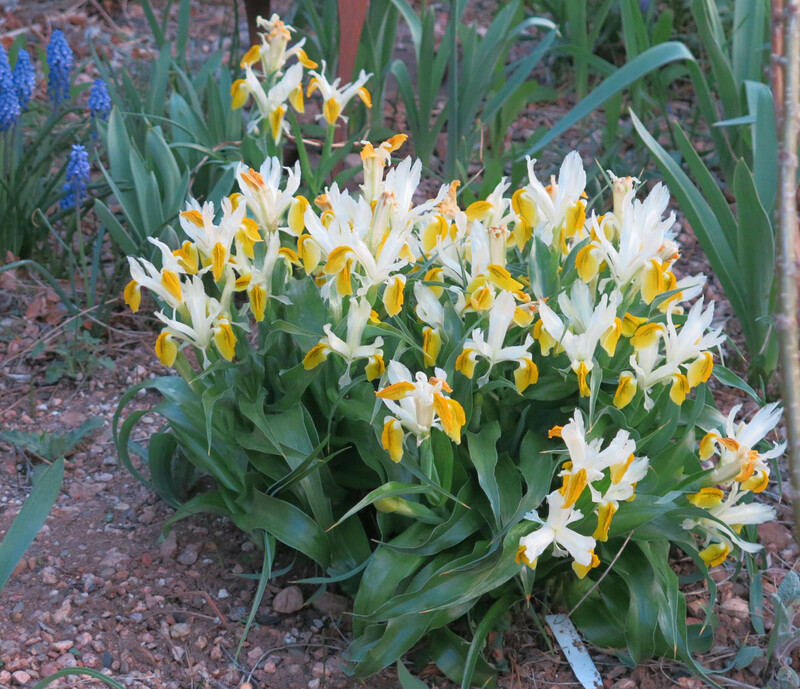 But Iris bucharica, which is one of the easiest, is having a very good year. These have been in the garden for a very long time, but were dug up and replanted a couple of years ago. That seemed to do them some good. The bulbs, which have long fleshy roots attached to them, are pretty deep in the ground. 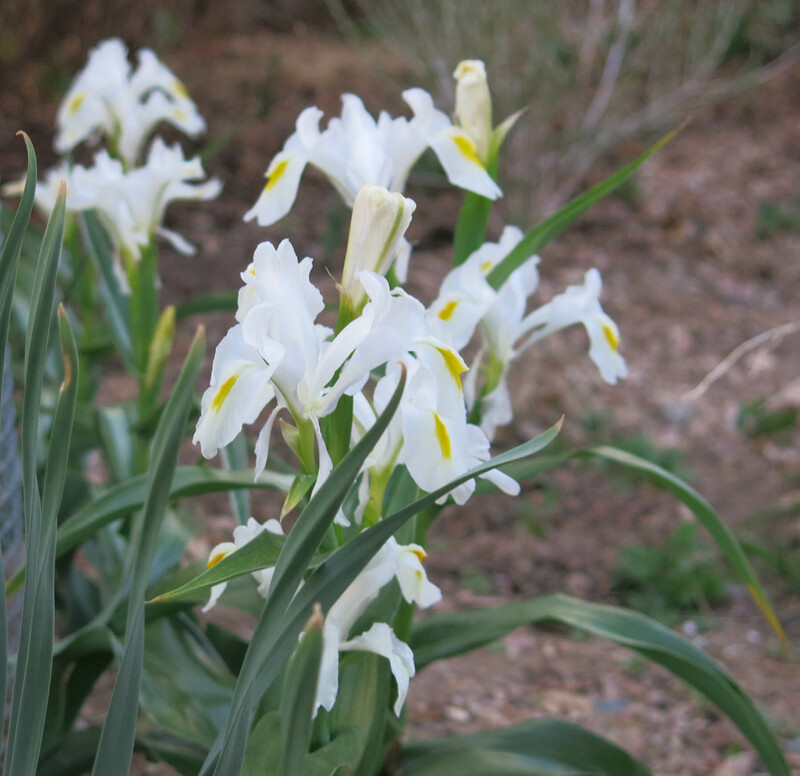 Iris magnifica, which is another Juno type, is “new at the zoo” this year, from Odyssey Bulbs. Now, as you may know, we purebred border collies are not allowed to drive cars. This is partly because we never get issued driver’s licenses, but mostly because we can’t see red. Like for stop signs and stop lights. This is what the guy I live with says, anyway. In other words I’m not much into red flowers. 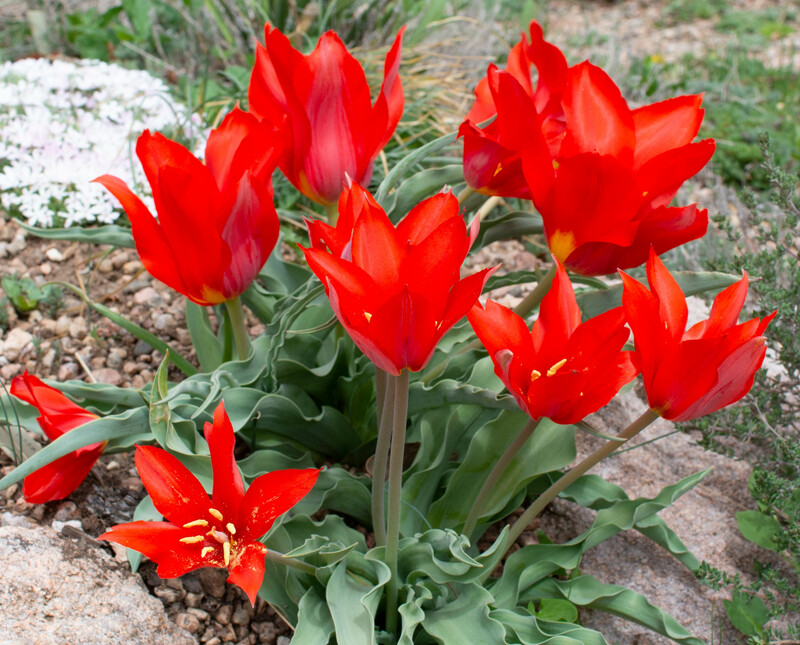 There are several red tulips flowering in the garden, or so I’m told. 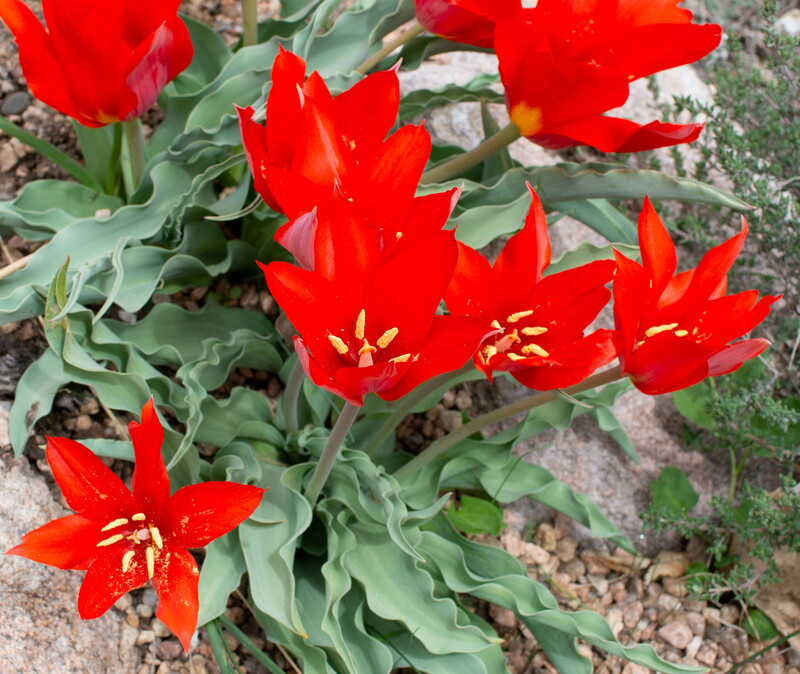 This is Tulipa butkovii, one of the reddest. Also one of the hugest. When fully opened the flowers can be six inches (fifteen centimeters) across. The guy I live with has been alternating between “The Big Bang Theory” (obviously) and “Midsomer Murders”; the shows are on the TV but he doesn’t really sit down and watch them. They’re just on. And then get replayed all the time. I mention this because I’ve kind of been going on, without explaining the Sprechhund business. In one of the episodes of “Midsomer Murders” it’s said that Sykes, the star of the show, really, is a Sprechhund, which is German for “a dog you talk to”. The guy I live with said that wasn’t German, only sounded like it, but I am a dog that he talks to, and talks to a lot. Like on our walks and pretty much all day long. He says this and he says that. Then he says more things. I talk, too. I know you know that if you’ve been reading the blog for a while. Just yesterday I had a whole bunch to say while the guy I live with was on the phone and the person on the other end could hear all the things I had to say. I got shushed more than once, but kept on talking. I could go on and on about myself but maybe it’s time to wind up this post. I’ll leave you with another picture of me in the garden, carefully guarding everything, and not worrying about thunder. Ha ha Mani. I asked Google to translate sprechhund for me. And do you know what Google said? It said sprechhund means “talking dog” which seemed to me also accurate in your case. Well, the blooms in your garden make me look at my own garden with a questioning eye, but the ordinary stuff is pleasing too, though not as red. Thanks; I do talk, but I am talked to, as well, which is what the Sprechhund is. If it were a real thing. I think the guy I live with just chooses his flower subjects carefully; the garden here is still pretty much of a mess. Which doesn’t really bother either of us. Your garden is looking good Mani with all its new greenery as well as those lovely flowers, especially the red tulips. It sounds as though you enjoyed your phone conversation too. Maybe you might be allowed to join in with other conversations too. Thanks; we don’t get many visitors but I could try out my conversational style on the next people who show up. As the child of a German-language teacher, one who was briefly bilingual, I can say with confidence that ‘Sprechhund’ isn’t real German, but ought to be. If a dog who’s been blogging for years and in frequent (if often one-sided) conversation with TGYLW isn’t a Sprechhund, who is? The new fence is sharp-looking — a more fitting background for a handsome purebred border collie than what used to be there. Thanks; I do agree that I make an excellent Sprechhund, even if it is fake German. The fences will look even better once they weather, which may not be very long at all. The sun here bleaches things pretty quickly. They certainly do look better than the ugly fences which were there before. I’m not sure what he was thinking when he embarked on projects which turned out so hideous. Storms here can be very bad. Doesn’t thunder around here, but fireworks at the hotel and the Convention Center across the bay sound off often. Sound travels over water, you know. How do you two talkers feel about fireworks? 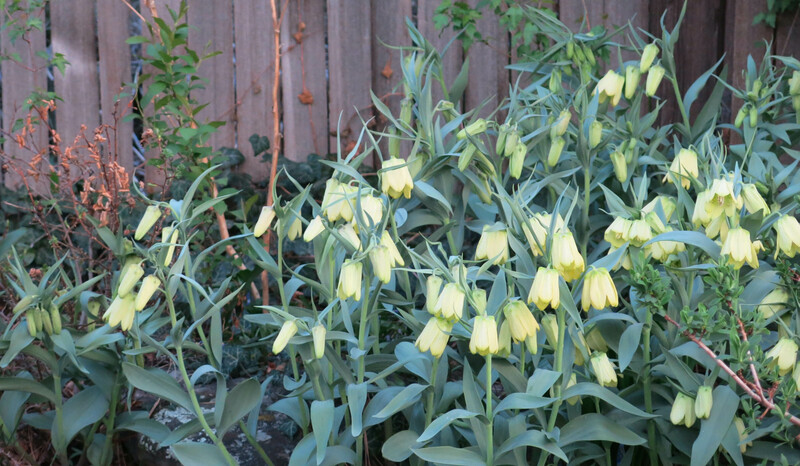 I like plants that combine subtle with lavish, and the fritillaria prettily does that job. The new fence in its simplicity smartens up the garden. An artful fence like that amidst garden chaos organizes and makes any mess look intentional. 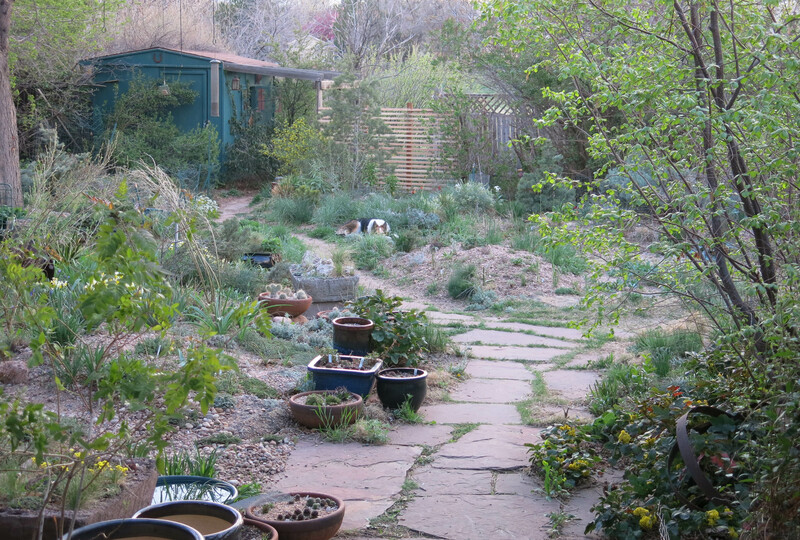 A fence like that is especially flattering to a purebred border collie in a garden. Your end photo seems not characteristic. I have thought of you as capable of major mischief, and the dog pictured portrays a mature and fierce guardian. Perhaps you look so warriar like when on the job. That was a long way away from here. In the meantime, though, it rained here. It rained, and rained, and then rained some more. Almost two inches in two days. And no thunder. I never bothered to consider that dogs can not drive because they can not see red! That makes sense. However, it does not make sense that, despite this reality, traffic signals still use red, rather than black, white and gray, or at least three shades of colors that dogs can see. Duh! How lame. It would be so nice if Rhody could drive. I would get us a nice old Buick and ride around in the back like the president of Los Gatos! However, if Rhody could drive, we just might end up in Kansas by mistake . . . or Algeria. Indeed. Though it does seem more appropriate that we dogs are driven around, rather than having to do any work. That is precisely what Privet said years ago. If Rhody could drive, he probably would. If I told him it was fun, he would believe me. Bill believed that the Blazer was a Bravada. I thought that he believed that it was shiny red rather than grungy blue, until you explained that he could actually see blue. He might have thought that I was really stupid, but did not want to make an issue of it. Or, he might have thought that grungy blue was a very special type of red. Indeed. We purebred border collies are apparently not too big on riding in cars. 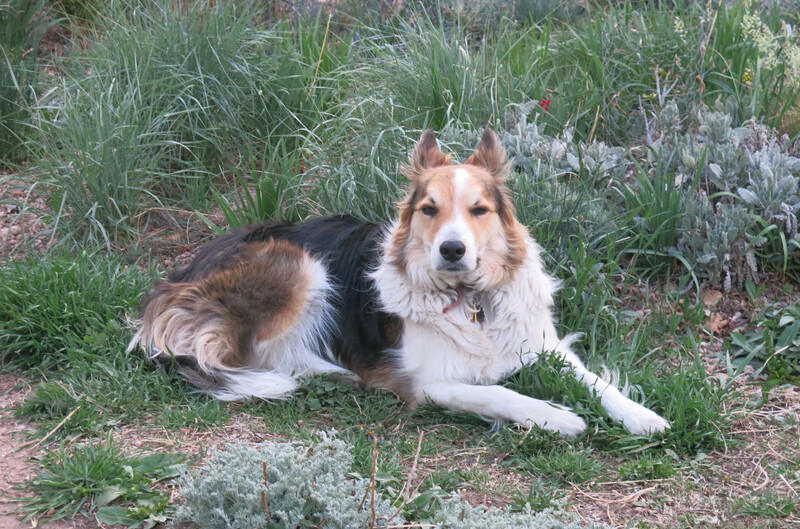 Pooka, the second purebred border collie who lived here, and who also had radar ears, got so carsick that the plan to have him be tested for herding certification (just to get the blue ribbon) was canceled, and after that there were no car rides at all, until I went to the mountains the couple times that I did. Mostly, staying at home and sleeping on the couch, or the soft Pottery Barn sheets on the bed upstairs, are much better than riding in cars. You are probably too young to remember, but there was a time when hounds enjoyed riding in back of pickups. But then, some might say that hounds are not exactly of such impeccable cultural refinement. They still do. I, however, am fitted with my Ruff Rider Roadie when I’m in the car.